Emission Labs. Frequently Asked Questions. 1. What to do in guarantee case? Best is to read the guarantee conditions first, you find that at the EML website, here. If you feel your case is not covered in an appropriate way, please let us know. 2. Do the tubes need a burn in? Yes they do! Good Burn-in will assure maximum lifetime and develop the final sound. Lifetime of EML tubes is exceptional long, as you can also see from our guarantee conditions. This also means, the burn-in process may take longer as compared to other tubes. Burn in may take 100…300 hours under normal (home) use conditions. Specially when it seems, burn in takes place only slow, the tubes rather need 300 hours than100 hours. It is better to switch off the amplifier after each use, for best formatting of the cathode. The tubes benefit from the cold periods in between. Some occasional blue glow effects will disappear during burn-in, or may stay. This is not gas, and it is normal. Use different loudness levels from the beginning, and increase the maximum loudness gradually. If tubes were switched off longer than 18 months, is may be necessary to repeat the burn in. Some background: These tubes are burned-in initially, because factory testing can only be done after the tube data has become stabile, and after a tube has developed strong emission. However emission of the cathode is still not homogenous at this moment. After full burn in, emission is build by many small islands, overlapping each other. Though initially, these islands do not fully overlap. This slow development of a homogenous layer, is the final burn in process. The tube should be give time for this, and not stressed into it. This is why we advise to do the burn-in process under normal use conditions. Many short use periods have a better result than few long periods. Switch off the amplifier after each use, and in the beginning not use the tubes longer than 4 hours at one time. Many short use periods have a better result than few long periods. The tubes need the „cold“ periods in between for best formatting. Use different loudness levels from the beginning, and increase the maximum loudness gradually. If tubes with very little use were switched off longer than 18 months, it may be necessary to repeat the burn in. So tubes that were not used for some years, may sound unpleasant, and simply need a new burn in. Blue glow during burn in: Some blue glow effect on the glass will disappear during burn-in, or may take longer to disappear eventually. What you observe, is a fluorescent effect, and it is normal with new tubes, even so proving the cleanliness of the glass itself. 3. Can I plug in 300B-MESH in any 300B amplifier? The answer is: Often yes, but not always. 300B-mesh must be used at typical 22 Watt dissipation, and maximum 28 Watt. 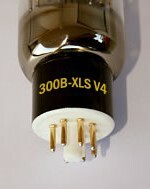 For the rest EML300B-Mesh is compliant with historical data sheets from Western Electric. So you need to know for sure, your amplifiers runs at a dissipation of 22....28 Watt, and you can just plug it in. In all other cases, you need to do something to get the dissipation (plate current) down. Read the 300B-Mesh data sheet for more information about this. 4. How does the sound of 300B compare to 300B-XLS, or 300B-mesh? 5. Can I use the tubes in horizontal position? 6. Are EML tubes microphonic? There is no general answer to this, because no standardized measurement exists. From our side we have done what we could, such reducing mass of the filament suspension systems, and using triple mica in some of the larger tubes. Unexpected for many, the inner system (plates, grid, etc) should not be attached to the mica very tight, or a ringing effect will occur. So if you hear some small mechanical noise while shaking a tube, this is not creating microphonics, rather preventing it. Also, the electronic circuit itself plays a major role in the overall microphonics. Good and bad circuits exists. WIth this respect we have seen finest circuit diagrams, designed by amateurs, and really beginners mistakes by companies with world known names. Optical quality and electrical quality do not always go together. Let's say this applies for tubes, and for amplifiers as well. So you can have an amplifier which has a microphonics problem with some tubes or tube brands, whereas the SAME tube, when used in another amplifier has no microphonics problem at all. People try to judge microphonics by tapping on the glass, but the relation between "tap-sensitive" tubes and microphonics is not very direct. When you tap on the tube, some inner system noise gets audible, such as resonance of the filaments. However, such noise will not appear under normal use conditions. Microphonics in the real sense of the word, means the acoustical sound signal gets in, through the glass, which follows another path, and follows other rules. Better is not to tap on a working tube, because you will stress the filaments. While glowing, the metal is soft and fragile, so they should not be tapped on when hot. To some extent, mesh tubes are less microphonic, since the woven mesh wire by nature is one of the best damping materials, also used in industry for this purpose. This does not apply for the fake mesh tubes that are made in China, these are solid plate with holes in it. This has only the optical effect, and nothing else. 7. Can I tap on a working tube? The answer is no. The filaments are red hot glowing, and the coating powder is easily loosened due to filament vibrations. Also, the filament's can break, due to crystallization effect. This will make the wire brittle. Some crystallization takes places on all metals, even when cold, but it can be triggered by vibrating the read glowing heater wires like a guitar string. (the "ping" sound you hear, when you tap a working tube). Cold filaments are very resistant against mechanical shocks though. So please treat a glowing tube with great care. 8. Can I serialize tube filaments? This is not a good idea. All tubes ever since 100 years, are made either for voltage powered filaments, a for a serial circuit. No other tubes exist. A current specified tube is made such, that if you inject exactly this current into the filament, and the temperature will be right. Moreover, current specified tubes have some constructional details which allows a short moment of over-current, which occurs when such a series chain is connected to the supply voltage. Yet in the end, the voltage across such tubes is not a parameter which is controlled very exactly in production, reason being simply you should not connect such tubes to a fixed voltage anyway. The opposite is with voltage specified tubes. Like a rectifier tube for instance which is specified for 5Volt, will have the right heater temperature at 5V. The current of two random tubes from production may vary somewhat, due to natural tolerance of coating thickness. However as long as the tubes are supplied with 5V, there is no temperature change because of this. However when two 5V tubes, with for instance 5% different heater current are serialized, it is obvious one tube is above 5V and the other is below 5V. 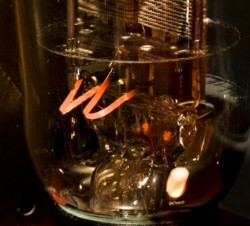 This by itself may already exceed the heater voltage tolerance of 5% only. This voltage unbalance will be much larger than 5%, because a constant current user will not follow Ohm's law. The above text describes in a nut shell, why you should not connect a voltage specified tube to a current source, and vice versa. Also read the next FAQ about this. 9. Can I use an electronic current source for the filament? No you can not. People sometimes try to things differently, and in an interesting way. Sometimes for the sake of doing it not like others. If you recognize yourself here, please read this advise. We all know, thermionic tubes are a 100 years old technology. In tube factories and design labs, during those 100 years, the number of people who have been trying new, clever and interesting things, must be in the order of millions. The world is large, and when I take 100 people per day trying "new" things, I find over 100 years 36.500.0000 attempts. Amongst those were sometimes just fools, and sometimes highly intelligent persons. People, like for instance Julius Futterman, who spend his whole life on improving just one circuit. You can really say, any new idea, whatever it is, has been tried out by 1000's of others, and if the idea was good, it would be known technology. It is not inspiring to say, but there is really nothing to wait for you to be discovered on a nice Sunday morning. It is virtually impossible to find something new with tube schematics. So when you have this fantastic idea, about how to do things like they have never been done before, just bet 1000's had the idea before you already, and it would exist already. So there is no "better sound" or longer life, if you use a heater current source, simply for the above reasons. A many ampere current source can easily be made from a ballast tube and a transformer. Use it as AC, or rectify the output signal to get a DC current source. Was that done by Western Electric and RCA, etc? No it wasn't. For best lifetime, you have to use the tubes as intended. The following is widely unknown, yet it is very basic information. That is: Tubes have VOLTAGE driven filaments, unless specified otherwise. A tube filament is not a resistor. So, it follows NOT Ohm's law at all. You can try this with an old tube, and make the voltage/current chart. Much to your surprise you will find the filament is a constant current user, when you are in the range of the normal voltage +/- 20%. You will see the optical impression of over heating the tube at 150% heater voltage, and after a while at 200% the heater will break. However you will find it is impossible to overheat this old tube at 150% heater current. If you do, heater voltage will become too high, and the heater will break before. The engineering conclusion from this is, a tube heater is a constant current user, when you are in the range of specified heater voltage! So if you want a constant current through the heater, all you need to do is connect the heater to a constant voltage and you're done! However if you connect the filament to an externally forced current source, you are doing a very curious thing. You are serializing a constant current user, with a constant current supply, each of which may have another value. So this is a serious contradiction. So you connect a 2A4 tube to a 2.5 Ampere current source, because the data sheet sais 2.5 Ampere. However at 2.5V, a particular tube may as well pull only 2.7 Ampere. In that case, the current source will drop the heater voltage until the tube pulls only 2.5 Ampere. Because that's what a current source will do. So you are not heating the tube with 2.5V any more. The result of this will be reduced tube life. Here is a numerical example. Suppose you have a 5Volt , 1Ampere tube by the data sheet. The 5V has little tolerance, the 1Ampere has high tolerance. In fact, this characterizes a voltage specified tube. This 1 Ampere is for instance +/- 10% tolerance. So your individual tube draws for instance 950mA at 5 Volt. However you ignore the 950mA, and you pump in 1000mA because you think the "data sheet says so". Then this 50mA additional can NOT flow, since the tube is a constant current user, here we have one with 950mA. The conflict comes now with electronic circuits, which have no other possibility, as increase the voltage until 1000mA flows, no matter what. This results in a filament voltage will be much higher as you would expect by Ohms law, since this law does not apply for a constant current user. The resulting voltage can be 6Volt instead of 5Volt. Which is not what you want. Another problem which occur is, the tube may not start to glow at all. Reason for this is, initial filament current of a fully cold tube is appr. 4...10x higher than normal, and some abnormalities can occur with the electronic circuit. Like it thinks there is a short, and it shuts down. Link to article at the jacmusic website. 10. Can I have 10% tolerance on the filament voltage? There is general misconception, if a parameter has no tolerance specified, one can take 10%. If you have too high filament voltage, this will shorten the tube lifetime. Reason is a very delicate balance, where the filament active layer is evaporating on the one hand, and regenerated from the inside at the same time. This balance is indeed very delicate, and it works best at the correct voltage. As a rule of thumb, lifetime is reduced 3%, for each percent the filament voltage is too high. If we take the 2A3 tube as example, it is made for 2.5 Volts. At 2.8 Volts, you are at +12%. Then 12x 3% = 36%. So lifetime is reduced by appr 1/3. This is so for all tubes, also NOS or Chinese. If you are above +15% another failure mechanism occurs, which is re-crystallization of the filament, much faster than normal. The wire will get brittle, and can no longer withstand the spring tension. Eventually this will lead to filament breakage. Damage by too HIGH filament voltage is permanent. Damage by too LOW filament voltage can often be undone, by simply use the tube at the normal voltage. If the problem was only moderate, it will self repair, provided the tubes are new. 12. About tube filament hum. Directly heated tubes have some transfer of the AC signal on the heater, to the output signal. If the heater is used "balanced" which is the only right way actually, the AC signal is very much attenuated, and on the tube output is almost nothing left of it. 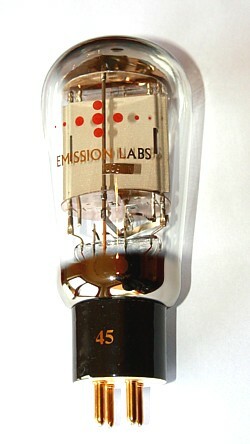 If the heater is used "unbalanced", the AC signal will be even amplified by half of the tube gain. So any unbalanced connection is typically when heater is connected with one end to ground, and the other end to +5V. This is dead wrong, and just asking for hum problems. So will end up with extreme requirements to the +5V, including low capacitive path via the mains transformer. Sometimes you will not be able to achieve a hum free amplifier with an unbalanced heater supply. Click here for examples of good and bad schematics. 13. I use an AVO Mk4 Tube tester, but the test results of the tubes are not good. Are the tubes defective? The AVO Mk2, Mk3, Mk4 are very nice for small tubes like 12AT7 etc, but not suited for triodes with low plate impedance and high plate current. AVO admits this when you look in their data tables for the 6080 tube. Also you will not find the 300B in most of their data books. That should tell enough. You can work around this, when you have a pair of new EML 300B (or 300B.mesh). The factory test values of our tubes are very accurate and guaranteed to reproduce within 5% on any good tester. With the AVO you need to set the plate voltage as on the EML tube box, and initially use -60V grid. Then change the grid voltage until you have plate current as indicated on the EML tube box. With this grid voltage you should measure the transconductance. The value should be close, to what you see on the EML box now. Leave the tester as is, and plug in the other EML tube. If both tubes show the correct transconductance this way, they are ok and your AVO also. Any differences are due to the AVO measuring with AC voltages instead of DC, and also many AVO need a new calibration, and by default are nor accurate on the 100mA setting, while using tubes of impedance below 1000 Ohms. This is a shortcoming of the AVO, which the factory has always tried to hide. Even the 2A3 measurement results, they publish faulty in the data book, so to hide this shortcoming. At jacmusic.com under tube testers, you will find a correction formula to use. Like this you can measure with the AVO the normal way, enter the result in this formula, and the result is the REAL plate current as it should have been. If you use the formula, results will be almost correct, but do mind the EML method id DC heated, so you need also test at a corrected grid voltage, of half the heater voltage. When also apply this correction, AVO results must be 100% correct. 14. I use the Amplitrex AT1000, but Emission is below 100%. Are the tubes defective? No, probably the tubes are fine! The problem is rather the Amplitrex software is below 100%. This is a long explanation, but interesting for users of AT1000. The hardware of the Amplitrex AT1000 seems made by a very good hardware designer, and not by a very good software designer. Moreover, they did not look into tube tester history, like what state of the art historical tube testers can do. What the AT1000 is doing, it measures plate current and then relates this to the average plate current of the data sheet. Even so making an error of half the heater voltage with Directly Heated tubes. So if the average plate current is 60mA by the data sheet, and a tube under test gives 50mA, this is 80% of Average plate current. Amplitrex says then EMISSION is 80%. Please excuse me, but this is wrong. e. For them, plate current is 80% of average, and they say then emission is 80%, they make it look as if only average tubes have 100% emission, which is plain nonsense. Even so, when plate current is 20% above average, the tube is said to have 120% emission, which is nonsense again. So how to say if a tubes is a good or a bad, because that's what they're trying to do. For this, simply take a vintage state of the art tester, and look in the handbook. (Sorry... but where else!) Let's quote what an expert said about this in 1959. We refer to Funke Germany tube tester handbook. So what is the tolerance of Plate current for new tubes? In the blue book, Max Funke writes in 1959, +/- 30% for European tubes and +/- 40% for American tubes. Meaning, a tube may have this tolerance, and it is regarded "good". So you get plain wrong information by the Amplitrex, telling you so called "emission" is only 90%. Though what they observed is 10% deviation of average plate current, which frankly speaking is a fine tube. Emission in reality can be at 130%, whereas average plate current in 90%. That is possible because (other like Amplitrex suggests...) emission and plate current is not the same. So how to test Emission? This can only be done with an impulse test. AT1000 could not handle this for larger tubes. First, we must talk about another issue with the AT1000: Gm is tested the wrong way, if done so in the FIXED bias mode. Of course you will measure something, but what were you looking for? Probably you are trying to compare the measured Gm, with the data sheet value. Well, that is ok, but then you must test under the same conditions, and AT1000 is not doing so in their default mode, which is using a fixed grid voltage. In historical datasheet have more meaning to me, than what Amplitrex is doing. In data sheets, you will see that Gm is always specified at 100% plate current. Not at a random plate current which results by coincidence from the fixed bias mode with a random device under test. For this reason, EML tubes are factory tested by setting the plate current exactly to the data sheet average value. If you are confused now, it is the same confusion Amplitrex had. To get the idea what is the right thing to do, we stay with the numeric example we already used above. So suppose a tube has 60mA in the data sheet. Then you CAN test it in fixed grid voltage, but that will give any random plate current between 70% and 130% of average, for a 100% good tube. However in historical datasheets, Gm is always measured at the same plate current only. That is for good reason, as Gm changes along with the plate current. So it is only logical, at 80% plate current ( 50mA instead of 60mA) you likely find Gm probably at 80% too. So you are disappointed! Now, test the tube the right way, which is: Test a 60mA tube at 60mA. Suddenly, you will find the SAME tube producing Gm close to 100%. I know this is confusing, but take some time, to read this a few more times, and repeat some of the tests as described here. A work around, saying something about Emission with the Amplitrex, is as follows: Take the datasheet and check at what plate current the tube was tested. Then take the required grid voltage for this, from the datasheet. Multiply this value with the transconductance. This gives a number, that you will find in no datasheet. However since Gm is in mA/V and Ug is in Volt, the unit of this number is mA. (because mA/V * Volt = mA. This indicates it is a current flow, and it's a has more to do with Emission than Ia, Gm or Ug each by itself. Here is a numerical example for the 2A3 tube. Datasheet value: 60mA at 250V plate and -45V grid. Gm = 5.2 at those conditions. Multiply 45 with 5.2 gives you 234. Remember this value: 234mA. It is characteristic for a 100% emission 2A3. Now, do the same thing with the tube under test. (WIth Directly heated tubes, you need to substract half the heater voltage to the grid voltage. This correction is needed for all testers that test with DC, and have forgotten to correct this in software. And yes, with the Amplitrex it was forgotten) So test at the 60mA and no other value. This is done at the auto bias setting with the AT1000. This will result in a result for Ug and Gm. Suppose that needed -44 Volt Grid at the AT1000. Substract half the heater voltage of this. Heater is 2.5V. So substract 1.25 from -44. There is a minus sign, so you get -45.25V. If Gm tested was 5.5 (at 60mA!) the result is now 45.25 x 5.5 = 248. Divide 248/234. This gives 1.06. Emission is 106% by this method. Whereas this tube would give a "so called" emission of 98% if you don't look what you are doing, and just press "TEST" on the AT1000. If a tube has plate distance tolerance (by drop error, or production tolerance) meaning Ug will go up an Gm will go down, or vice versa. So the multiplication method will make no mistakes, whereas the original AT1000 method will make errors then, like come up with emission of 110% for tubes that are 90% in reality, or vice versa. Conclusion: For Emission tests, use the above multiplication method, and compare it with the RCA datasheet values. If you are close, the tube is new. If you are clearly below, the tube has reduced emission. 15. There is a white spark inside the tube, at switch on. Sparks in vacuum, if they exist at all, stay only very short, and since there is no path to damage (only vacuum...) there is usually no damage. However you do need to find what causes this, because if repeated very many times, the cathode wire will chip off particles at the spark point, and loose quality that way. The question already gives a clue to the answer. As observed, this is a switch-on effect. So it has to do with the way, the tube is switched on. Basically any NEW tube can be forced to spark when it is set to draw too much anode current, while the heater is not fully warm yet. Too much anode current, means exceed the data sheet peak value. This condition cam sometimes take place at switch on. Aged tubes have less peak emission, and have not the capability any more to draw so much current, to initiate a spark. So sparks occur mainly with new tubes. The question is to blame the tubes for this, or the amplifier. The wrong approach, is saying it helps to replace the tubes, though it often helps indeed. You may be replacing the tubes with the old ones, or some others that have less emission. Replace the amplifier for another brand may also help indeed. Neither of those methods is a good one. What you need to know, is the maximum anode current exceeded, short before the spark occurred. This is the right approach. Then if you verified this (with a scope), you know where you are. When the answer is yes, the peak current was exceeded, then you have a problem with the amplifier. In the opposite case, it was the tube. There are a few ways to solve an amplifier related spark problem, but for this it needs some expertise. With rectifier circuits, we find mostly the first capacitor value is higher than maximum. We see sometimes 5x higher as allowed. A weak solution, is select tubes that can take the abuse. If the spark occurs only occasionally, it will disappear when the tube gets older, and looses emission due it's to age. The main reason for sparks with Triodes, is too high coupling capacitors. As these are empty at switch on, these have to be fully charged at the working voltage, which is the supply voltage normally. In a common circuit, this means a charge peak current flows through the capacitor. This current flows through the grid resistor, as there is no other path. Specially if this resistor is too high, and the capacitor is too large, you may have much voltage resulting from this, that off-biases the tube at that (short) moment. If amplifiers have an analog plate current meter, you will see indeed the plate current over-shoot 30...50% sometimes. This is the risk zone, and may work out harmless. However when the off-bias becomes so large, a POSITIVE grid voltage occurs, this may spark sometimes the tube. Specially when they are new. The solution is to change the RC network. Practically speaking, make the grid resistor or the capacitor smaller, so the whole effect reduces, and the spark will be gone. 16. There is something glowing down inside the tube bulb. Is that a defect? What you see here, is a current dependant resistor, in vacuum technology. You will see it as glowing element, but the resistance of these wire pieces is variable. This is an old technology, but it's an Emission Labs invention, to use it this way. Please refer to the 5U4G data sheet. for a general explanation of this.